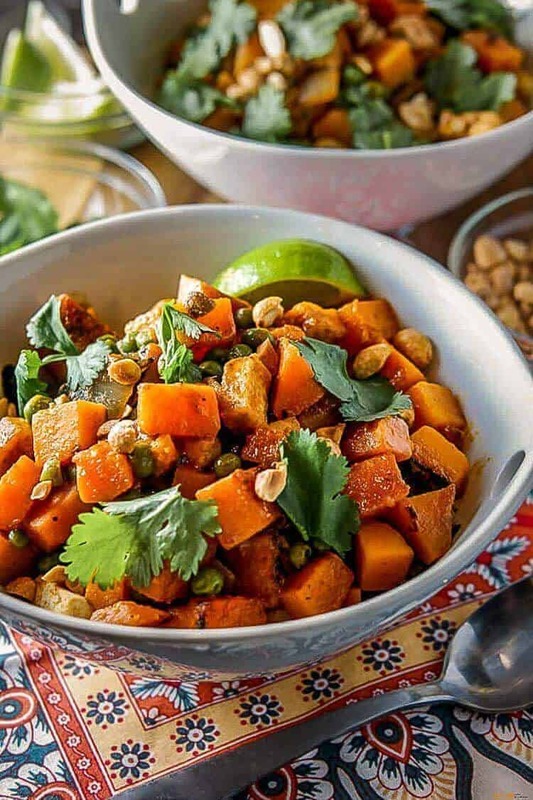 A delicious, healthy curry dish… perfect for your weeknight supper, Thai-Style butternut Squash Curry is full of healthy ingredients and traditional Thai flavors. This dish is sure to please even the carnivores at your table! Myriad reasons exist for the adoption of a vegetarian diet. George Bernard Shaw railed against the slaughter of animals as he passionately proclaimed “animals are my friends… and I don’t eat my friends.” Whether you abhor the killing of animals as he did, you want to minimize your environmental footprint, or you simply desire a healthier lifestyle, eating well-balanced vegetarian meals either exclusively or occasionally can be a very positive choice. 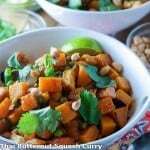 My Thai-Style Butternut Squash Curry is chock-full of flavor, good nutrition, healthy fats, and plenty of protein! When my husband finished a PhD and accepted his first position at UC Irvine in trendy, fitness-oriented Orange County, California, we were surrounded by vegetarians “for moral reasons.” At 28, I was impressionable, and desired the very best for my young family. We became vegetarians. It was an easy transition with the beautiful and varied produce available at the Orange County farmer’s market. A few years later, we moved to Las Cruces, New Mexico, and suddenly the vegetarian diet became quite a challenge. At the same time, I got serious about fitness, and the additional protein requirements made it even more difficult. Since that time, I have focused on a healthy, varied, and low fat diet, and continued to include vegetarian cooking on a regular but not exclusive basis. Studies show that vegetarians are consistently leaner than their omnivorous counterparts. The most convincing evidence for the health benefits of a vegetarian diet relates to the reduced risk of heart disease, but studies show reduced risk of cancer, hypertension, and diabetes as well. It is unclear whether the benefits stem from the reduced intake of animal fats and protein or the increased intake of plant foods such as legumes, whole grains, seeds, and nuts. A healthy vegetarian diet requires more than just removing the animal protein from your diet. I’ve mentioned the importance of a two-pronged approach to fitness – a healthy diet and regular exercise. Protein becomes even more important if fitness is a regular part of your life. When you look at a vegetarian recipe, look for a combination of whole grains, legumes, beans, nuts, soy products, etc. Serving my Thai-Style Butternut Squash Curry recipe over quinoa adds about 18 grams of protein per 1 cup serving. Personally, I enjoy vegetarian cooking at least a couple of times a week for both environmental and health reasons. I don’t typically miss the “meat.” There have been times when my family agreed that adding chicken or shrimp to a vegetarian dish would have been a negative. If you are trying to add more adventure and variety to your meals, including an occasional nutritious vegetarian meal is a great way to do it! The best way to cook tofu (in my opinion) is to slice the tofu block horizontally into slices about 1/2″ thick. Place the slices between layers of absorbent paper towels or cloth. Place something heavy on top – I use a cutting board with a couple of cans to add weight. 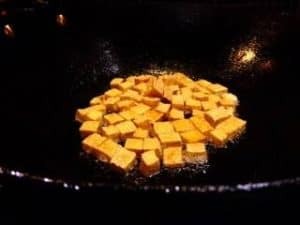 This step removes additional liquid from the tofu, and provides better frying and browning results. Allow tofu to drain while you prep the squash. Cube the tofu (1/2″ cubes.) Heat about 2 tablespoons of peanut or canola oil in a wok until it is quite hot. Add the cubes of firm tofu. Use the wok handle to gently agitate the cubes in the oil to keep them from sticking. When the edges begin to brown, gently turn them. When you see that the cubes have some nice browning on most edges, remove to dry paper towels to drain. Cooking the tofu too long will result in dry, chewy tofu. You just want it starting to brown. Remove excess oil from the wok. The wok will be used to finish the dish, but you don’t need much oil. Sauté the squash in your wok or dutch oven with the onion until the squash cubes begin to brown and the onion is translucent. In a separate medium-sized prep bowl, combine the broth or stock, peanut butter, red curry paste, coconut cream or milk, fish sauce, and lime juice. Whisk vigorously until smooth. When the squash and onions are ready, add the sauce mixture to the wok or pot. Stir to combine. Add the peas and prepared tofu. Lower heat to a simmer and cover. Cook until the squash is tender. Serve over quinoa or brown rice, and garnish with chopped peanuts and cilantro. 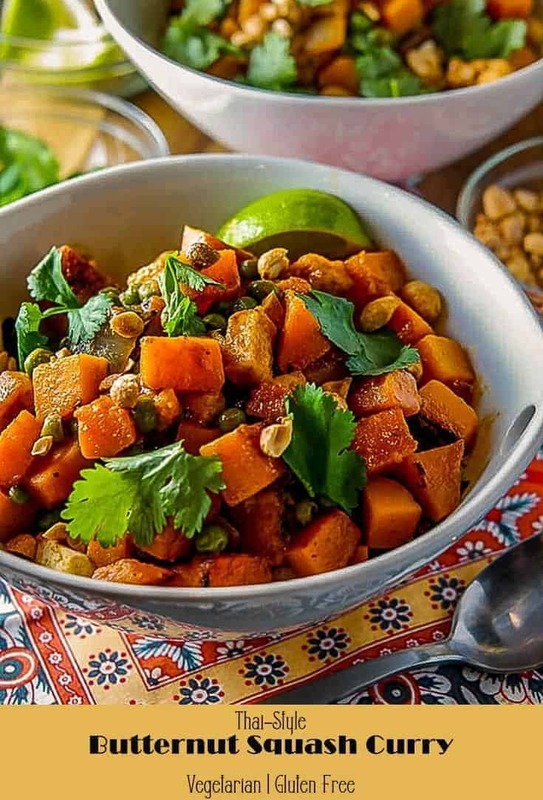 A delicious, healthy curry dish... perfect for your weeknight supper! Gently stir-fry until edges begin to brown. Remove from wok, and drain on paper towels. Remove excess oil from wok. Over medium-high heat, add butternut squash cubes and chopped onion. Stir-fry until squash begins to brown and onions are translucent. Whisk broth, peanut butter, coconut cream (or milk,) fish sauce, curry paste, and the juice of 1/2 lime together until smooth. 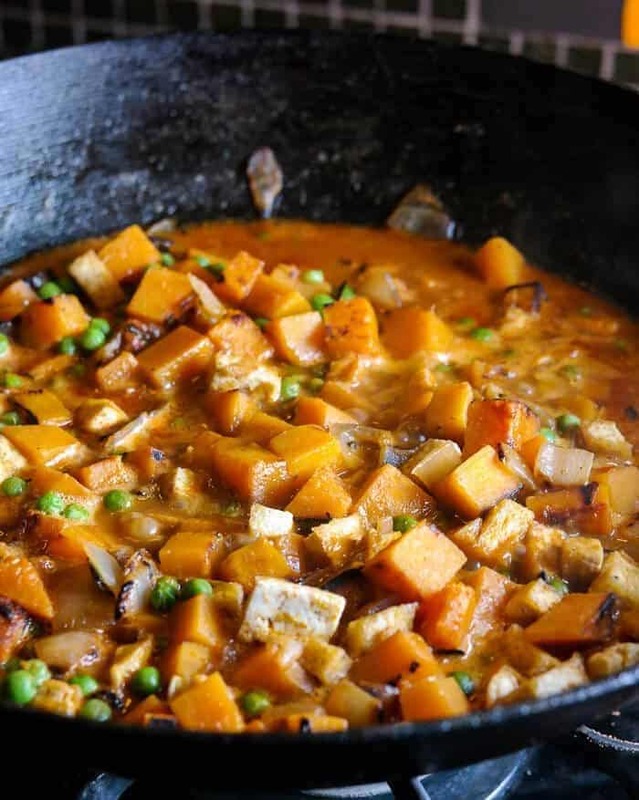 When squash is beginning to brown and onion is translucent, add combined sauce ingredients, peas, and prepared tofu to the wok or pot. Give it all a good stir. Cover. Simmer gently until squash is tender but not falling apart. The amount of time will depend on how long it was stir-fried, but 10 minutes simmering with the sauce should be adequate. Serve the curry over quinoa or brown rice prepared according to package instructions. Garnish with chopped peanuts, cilantro, and a wedge of lime. Coconut cream is thicker and more concentrated, and harder to find. You can substitute 1/2 cup coconut milk, just reduce broth by 1/2 cup. *Thai curry paste is spicy. Add more or less to taste. Fish sauce is made with fermented anchovies. If following a strict vegan or vegetarian diet, substitute a light soy sauce (such as ponzu), tamari or a vegetarian fish sauce. Look for tamari if you are gluten intolerant. Always read labels! « Healthy Eating+Exercise=Fitness… Turkey Italian Sausage & Pasta on Your Table! Haha! Yes, I agree... I hope you will try the recipe. I have had no relationship with any of the cattle, pigs, chickens, turkeys, fish, shellfish or other creatures that I have eaten (or eaten parts of). But this sounds like a good recipe!